The 46AE is a free-field microphone set and as such optimized for all acoustic applications, where the location of the main sound source is known and the microphone can be pointed directly at it ensuring 0° incidence. The medium frequency range makes it ideal for general acoustic diagnostics. 46AE conforms with IEC 61094 WS2F and IEC 61672 Class 1. Regarding temperature range, see the Specifications. Should higher temperature limits be required, we recommend the GRAS 146AE 1/2" CCP Free-field Rugged Microphone Set which can be used up to 125 °C. A front-vented version is available, 46AE-FV 1/2" CCP Free-field Front Vented Microphone Set. 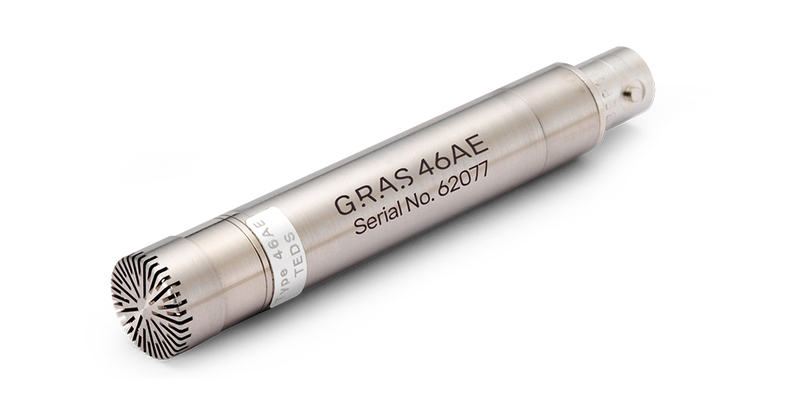 The GRAS 46AE is a high-performance 1/2” free-field standard microphone set for measuring medium sound pressure levels at medium frequencies. In our clean-room environment the set is assembled and sealed with a label. However, the microphone set can be dismounted, if you wish to use the components separately. The microphone cartridge is the high-quality IEC 61094 WS2F standardized GRAS 40AE 1/2" Prepolarized Free-Field Microphone, designed for long-term reliability in multiple environments. The high sensitivity and reliability has made 40AE the preferred measurement microphone for sound level meters/analyzers with CCP-option and, as such, enables IEC 61672 Class 1 measurements. The preamplifier is the GRAS 26CA 1/2" CCP Standard Preamplifier with BNC connector, and based on our well-known circuit board substrates. In the industry these are famous for their low self-noise, wide frequency and excellent slew rate performance. To perform as specified the GRAS 46AE microphone set requires a constant current input module that can deliver 4 mA and 24 V unloaded CCP voltage supply. If the constant current supply is lower, the capability of driving long cables is reduced and consequently the upper frequency is reduced. If the voltage supply is lower it will influence the upper dynamic range. The 46AE is delivered with Generation II TEDS. The calibration data is programmed into the built-in TEDS according to IEEE 1451.4 using UDID I27-0-0-0U. If your measurement platform supports Transducer Electronic Data Sheets you will be able to read and write data like properties and calibration data. *If used at temperatures higher than 70 °C, use high temperature cables. 1/2" CCP Pressure Standard Microphone Set. This is the "standard" rear vented version. 1/2" CCP Pressure Standard Microphone Set, Front Vented. Identical to 46AE, but with front venting.